Two of Triple J Unearthed Big Day Out winners for 2013 team up for a tour of Qld and Victoria. 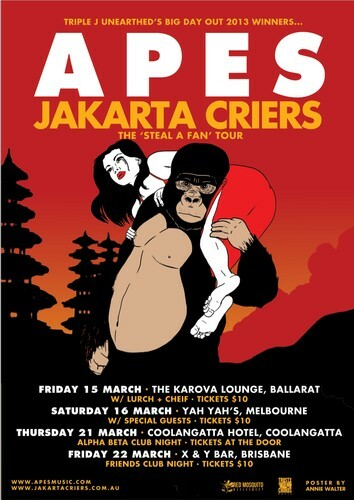 Featuring Melbourne band APES and Brisbane's Jakarta Criers, the tour will see the two band play 4 shows in tow states across a fortnight. Touching down in Brisbane, the Gold Coast, Ballarat and Melbourne.